Isn't it nice when you find a way to redeem a mistake? That's exactly what I'm trying to do here in this latest bead embroidery tutorial! I made these flat jelly roll polymer clay pieces several years ago, and was less than thrilled with how they turned out. By far the biggest disappointment was that I should have placed them over scrap clay to get a rounded shape rather than leaving them flat. So grab your free copy of Chapter one of Every Bead Has a Story, and join me in making lemonade out of lemons! 1. 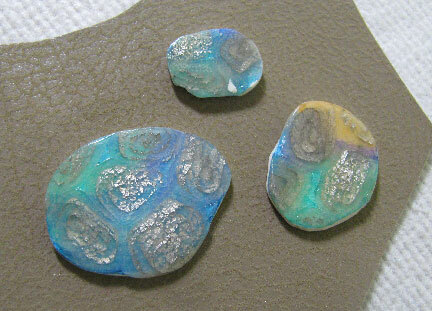 Adhere your cabochons to a piece of foundation fabric. I used glue this time instead of double-sided tape, because I am a little more fearful of pieces popping off since they are totally flat rather than rounded. 2. To begin, I added a row of back stitch around each shape with size 11/0 seed beads. 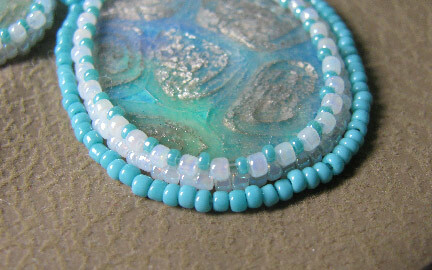 Make sure your bead count ends up an even number. 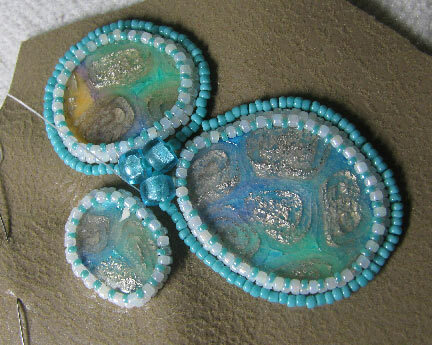 I then added one row of peyote stitch with the same beads, and one row of peyote stitch with smaller size 15/0 seed beads. Cinch the top row in to cover the edges. For the piece shown above, I've also already added one more row of back stitch around the shape. Join me for Part Two next week and find out! Okay, you're making me want to get my cabs out!! HA!! My evil plan is working! Looks like 'sea glass' as someone said once....look forward to next installment! Thanks! "Still, live and learn...and use what you have rather than always buying more!" That's a really good motto! I've been drooling over a set of big brush India ink markers with sets that start at $50 for four. You made me think, "I've got India ink; I've got brushes. What do I need with a set of brush India ink markers?!"